The feature that everyone has been waiting for is complete. Yes, we can now edit income and expense categories in Track Every Coin. You can now set your own categories of income and expense. To edit categories, click on the edit button next to the category pie chart. You can add, rename, delete and modify any category. 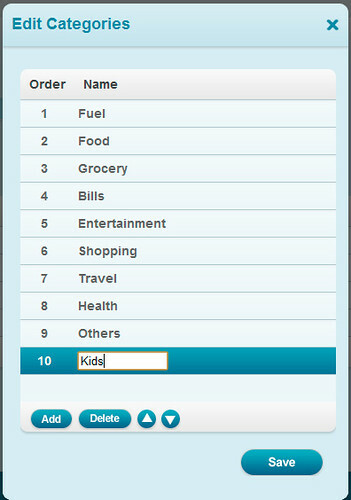 If you are a parent you can have categories like: Kids / School etc. If you are a small business, you can have categories based on different expenditure heads in the company. You can also edit your income categories to suit your requirements. So go crazy and create your own categories. Once you have typed a category name press “Enter” to save the category – This is an important step. Click on Save to finally save your list. We feel this is a very important feature that will help you get financially organized. Do let us know your comments and feedback. Hey this is just amazing.. I was doing the same in Excel.. this seems to be great.. thanks to all who did this.. Thanks for your feedback. It means a lot to us. To add a new category follow the above procedure. After you enter the name of the category please press “Enter” key for the name to be shown in the list. After you see the category in the list, now click on the save button to finally add it to your account. Feel free to contact us if you are still facing any difficulty. How come when you add a salary and designate as a recurring biweekly income it doesn’t update your income on a recurring basis? Currently I have to manually enter my income in every 2 weeks? There was an issue in our system. We have now fixed it. Feel free to contact us if you are still seeing this problem. I’m trying to add new categories in “expenses”. I click on the space, type in the new category, click “enter” then save but it never saves it. I can only use the ten that already exist. Can you help please? After you enter a new category, press enter. You should be able to see the new category even when you click on other categories. Click on save, it should save your category. If you are having trouble with internet explorer, please try mozilla or google chrome.